Duration of use: May be used up to 2 weeks. Medicinal ingredients: Each tea bag (1.5g) contains: Organic roasted dandelion root (Taraxacum officinale) 1,500 mg. Cautions: Consult health care practitioner if symptoms persist or worsen. Consult a health care practitioner prior to use if you are pregnant or breastfeeding. Contraindications: Do not use if you have liver or gall bladder disorders, and/or bowel obstruction. Discontinue use if you develop symptoms of liver trouble. Traditional Medicinals® is certified by the California Certified Organic Farmers (CCOF). This is my favourite herbal tea. It's a good substitute for coffee because it has a nice bitter flavour. I really like this tea as it seems to help with stomach and digestive issues. Absolutely adore this product. It tastes bold and bitter, but not too much. Love detoxing my liver this way! I really enjoy this tea. I have purchased it a few times now. It is good as a coffee/tea alternative. It also seems to help settle my stomach and help with bloating. Love it with cream and sugar as a coffee substitute. Great taste and really helps aid digestion. Great to also help with hormones as well. I really enjoy drinking this tea in the afternoon. Since I can't drink coffee because of the caffeine, this is a great substitute for me. I use 2 tea bags per cup to give me a lovely coffee flavour which I miss. The health benefits are an added bonus. Great alternative to coffee. Helps me digest better. The flavor is wonderful . I've collected and enjoyed many herbs to make tea. Since I have digestive issues, I try to stay away from coffee. 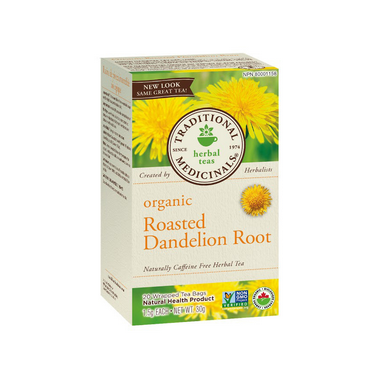 Dandelion root tea is the perfect alternative to drinking coffee. The flavour is wonderful and I don't get the jitters or an upset stomach. Awesome tea! Wonderful just as is, or with a little coconut milk. This tea is very warming in the morning and makes for a great caffeine free substitute for coffee. I wasn't sure how I liked it until my third tea. It really has an aroma that smells like it came from the earth which seems very nostalgic with every cup. I've purchased it for many times. Love it. Wish it comes with more tea bags. I am not sure I like the taste that much. It's like a weak dripping coffee with a touch of peanuts (roasted). I bought it because Dandelions contain vitamins and minerals, have a huge array of benefits (help with weight loss, stimulate digestion, detoxify the liver, etc. ), and are caffeine free, making this tea perfect to enjoy in the evening. Despite the taste, I will buy again. Like the taste. Hope it comes in more tea bags. I did not like this tea. I bought if for the health benefits, but it makes me feel nauseated after drinking half the cup. I like the taste and it is a nice change from regular black tea or Earl Grey tea, some of my favourite. Plus, it is good for you. I must agree that the thought process of using two tea bags as apposed to using one is a little bit annoying. Overall, I am satisfied and would recommend this. I wanted this tea for the detox properties of dandelion root. Surprised by the pleasant chicory taste. One criticism, why on earth doesn't the company put twice as much dandelion root in each tea bag instead of instructing me to pour a cup of boiling water over 2 tea bags? I'm not getting 10 cups of tea out of one box, I'm getting 5. It should be sold that way. I don't get the thought process behind the packaging. A great tea. Use it as a replacement for commercial iced tea. Usually make a pitcher, add honey & lemon while hot then refrigerate. Drink hot mid day. Find that it really helps with digestion. Great price at WELL.CA & will continue to use. Normally, I drink black tea with a little cream and sugar. I like the taste of this tea with nothing added so I guess my body approves but I can't say that I see the health benefits, not sure what to look for other than better digestion but that's a pretty complex process with many contributing factors. I'm on my second box, I drink it occasionally when I want something warm that's not tea but good for the body/health. Certainly it is a different flavor that is for sure. If you sip it and relish the taste then it is very nice. I have not used it enough times or long enough to see any benefits, but I do drink it for the benefits it claims to have. Anything for health right?! And, yeah it has kind of a coffee taste, it is very nice in the evening before bed. Will buy again, oh I did already.. lol. My first cup of this I did not add anything, and I could barely drink it. But, add 1 tsp of good honey, a tsp of cream, and it is just wonderful. My favorite tea. It has a roasted flavor, actually similar to coffee. Would definitely be a good, healthy substitute to coffee. I may increase my intake to 2 a day to see how is helps my skin. Love this tea. Great for digestion. At first, the taste was awful but by the second day I became accustomed to it. Now, I am on my 3rd box of tea. Was great to drink over the holidays. I love this tea and have been using it for quite sometime. I just put a little splenda into it -- usually have it in the evening since it has no caffeine. Great product and great taste! My son loves it and usually he doesn't drink tea. My wife and I really enjoy the flavour of this product. It has (for us anyway) a delicious roasted flavour much like a perfect piece of toast. I despise the taste, but after reading some other reviews I might try to add something to mask the taste. Super fast shipping! I love this tea. It is smooth, no bitterness at all and doesn't leave any aftertaste or dry mouth. This tastes amazing with some honey and soy milk. Smells like caramel, tastes slightly like coffee. So delicious and the health benefits are a huge plus! Great product. It's difficult to find quality organic teas especially if they're not a common ingredient. The health benefits have been great. I was getting lots of pimples along my jaw line and found out that is an indication of any unhappy liver. I began drinking the dandilion tea and my face started to clear up fast. My daughter is experiencing the same issue so will have her try the tea. There wasn't anything else I started so can only thank the tea! Love that it's organic and all-natural! I haven't tried it alone since I usually make a pot and add it to another flavour of tea. Since other reviews have enjoyed the flavour I will try. It's a great summer treat too! Brew with a little lemon juice and honey and then chill...makes a nice decaf/low calorie iced tea. Very good quality product and good value. I like the roasted flavour closely resembling coffee. I'm not much of a tea drinker, but find this has a pleasant taste to it. It has a slight diuretic effect, which is helpful those days when I'm retaining water. Great tasting tea, and soothes my stomach. Enjoying this tea as I write - nice smooth flavour. It's a bit early to assess health benefits as I've just started to use it on a daily basis. However, I really like this tea andI will certainly order again as ordering online is very convenient. Reading the reviews, I notice others seem to enjoy the taste of this tea. Myself ... not so much. That being said, its benefits are wonderful and it has proven itself to be very effective. Thanks to its detoxifying effects, I have felt energized and my skin is nicer than ever. Despite my slight dislike of the taste, I would re-order it any day. I love this product. The taste is very agreeable. I will buy again for sure. Really enjoy this product has nice flavour. Convenient to be able to order online. A really nice strong flavour, and a good price.